O, hang on. Sorry, got that bit wrong. 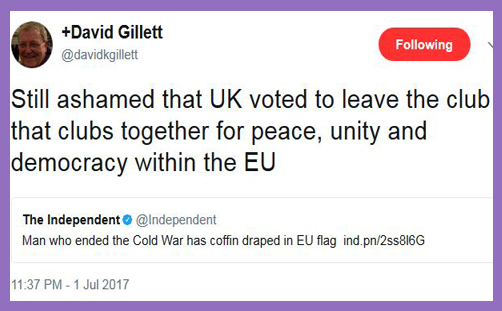 David Gillett is a bishop ashamed that the UK voted to leave the EU. He is a bishop ashamed of Brexit. He is of the view that it is wrong “to leave the club that clubs together for peace, unity and democracy within the EU”, which is a little confusing, not least because (setting aside the bizarre assertion that he thinks the EU is a club within the EU) it is NATO that has kept the peace in Europe; EU ‘unity’ is riddled with division, discord and denial; and the whole project is fundamentally anti-democratic and has been so since its inception. It is heartening indeed that he changed his mind, for it is unsettling to learn that a Church of England bishop is ashamed of the 17,410,742 people who voted to leave the EU (and that is exactly what they will infer from his tweet; that David Gillett is a bishop ashamed to be associated with a sizeable multitude of his flock). But he wouldn’t have reflected on his wording unless he had been challenged to justify his (over)reaction. The Bishop is, of course, perfectly free to feel ashamed of any democratic outcome: the majority may indeed get it wrong; the mob is not infallible. But his tweet evidences (once again) the contempt which many Anglican clergy have for the people they are supposed to pastor. If you’re a Conservative-voting Brexiteer, the vast majority of the leadership of the Church of England view you with a degree of spiritual pity and intellectual contempt, at best, or as being racist, xenophobic or hateful, at worst. If (God forbid) you happen to be a Trump-supporting, Conservative-voting Brexiteer, well, you are the stuff of which nightmares are made on, and your petty little life is rounded with an apocalyptic insomnia. Bishop David Gillett isn’t stupid: you don’t become principal of a theological college – training the vicars and bishops of tomorrow – without spiritual discernment, intellectual maturity and theological wisdom. So quite why he harps on about “the small majority” that voted to leave the EU is a mystery. Is a gap of 1,269,501 people really ‘small’? What about the overwhelming assent of Parliament to initiate the Article 50 process? That Bill was passed by 498 to 114 – a majority of 384. Doesn’t that count for something, or is that a small majority, too? What majority would have satisfied Bishop David? A 6% gap? A 10% gap? a 25% gap? 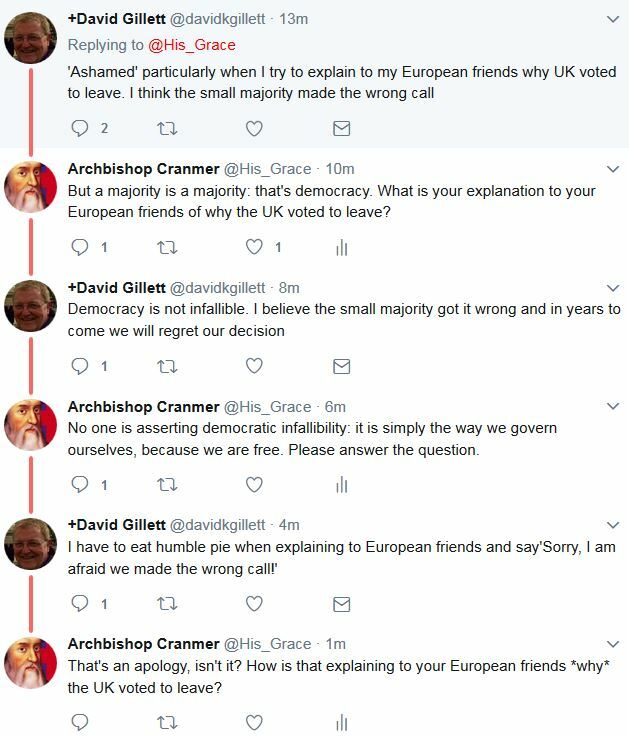 And here, of course, we come to the nexus of the matter, because for clergy like David Gillett there is no democratic majority which could ever justify something so uncivilised, barbaric and fundamentally anti-Christian as Brexit. The EU, he avers, is the very mechanism of European peace, unity and democracy: it is a work of God, blessed and hallowed for its transcendental mission to usher in a new world order of love, concord and pacifism. Our membership of such a sacred body should never have been subject to something so crass as the will of the people: what on earth do they possibly know about what’s good for them? What can the uneducated, unenlightened rabble really understand about something so lofty, intricate and divine as the EU? It is a mistake to believe that “the small majority” is insufficient to effect profound change in the established order, for that is to deny freedom to the individual; to undermine the grounds upon which action may justifiably be taken. Certainly, there are arguments for some constitutional changes requiring a super-majority, but membership of the EEC was secured and affirmed without such a demand, and so leaving the EU ought to be subject to the same procedural mechanism. To insist otherwise is to support an unintelligible randomness which is designed for pre-ordained ends, that is to say a teleological rather than democratic system. The Bishop may have repented of his shame, but he has evidently not changed his view of the authority by which change may be effected. Democracy is by no means perfect: it is often muddled, murky and eminently corruptible. It is, as Churchill famously observed, the worst form of government – except all those other forms that have been tried from time to time. But all those clergy who cling to the dream of EUtopia might consider the consequences for democracy and the Queen’s Peace itself if, having voted to leave, the elites conspire to keep us in with their obfuscational committees and rigged commissions. What are democrats supposed to do when the ballot box ceases to function as it ought? What alternative means are open to them to effect change? If Anglican clergy continue to preach that the wisdom of the crowd is wrong or immoral when the outcome doesn’t cohere with their personal political preference, we are left with the impression that all-wise oligarchs and less error-prone philosopher-guardians are a better form of government, supported by the aristocratic and plutocratic elites. Kings and priests have long claimed to know what God wants (or the gods want), so it makes perfect sense for us all to do exactly what they say. But the Greeks rejected this idea somewhere between 750-500 BC, and the rest of Europe followed suit between AD 1500-1750. England ditched government by divine right in 1688-89. Pooling wisdom does not guarantee the right outcome or the best answers, but, as with a jury of 12 in a court of law, it inclines toward greater justice and maximal mercy because decisions are owned by the people. Be ashamed of a democratic decision if you wish, but it is the system by which slavery was abolished, women enfranchised, children liberated and poverty alleviated. The pooling of collective ignorance by “the small majority” is a woefully pessimistic view of people’s democratic participation, and unbecoming of representatives of the Established Church. Their task is to respect the outcome and pray for those who are tasked with leadership. No doubt they wouldn’t be so ashamed if the people had voted Remain or if Jeremy Corbyn had won the General Election by a “small majority”: God moves in mysterious democratic ways.